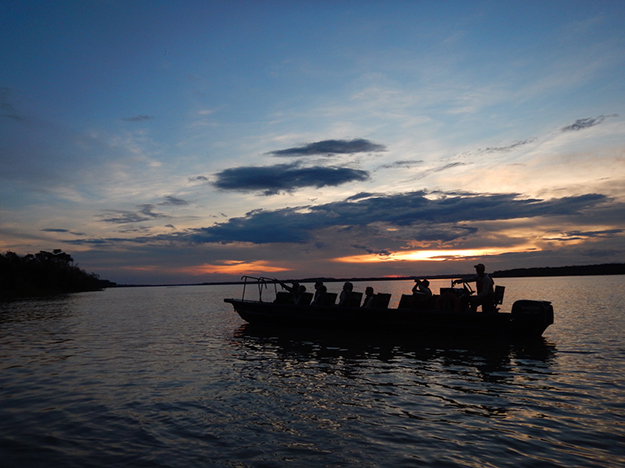 IN THE PERUVIAN AMAZON – Night settles on a skiff full of modern-day explorers on the Amazon River near Iquitos, Peru. The skiff operates off of the Zafiro, a 38-passenger excursion boat that takes adventurous travelers deep into the Amazon rainforest on weeklong cruises. Amazon skiff. Image by Tom Adkinson. The turnaround point for the cruises is the Pacaya Samiria National Preserve, a protected area visited by only about 3,000 people a year. Naturalists aboard the Zafiro are experts in identifying many species of wildlife, including pink river dolphins, sloths, monkeys, snakes, bats, caimans and toucans colorful enough to be on boxes of Fruit Loops. Trips on the Zafiro are organized by International Expeditions, an adventure travel company in Birmingham, Ala.